The Michigan Music Teachers Association (MMTA) State Conference is to take place Sunday, October 17 – Tuesday, October 19 at the Detroit Novi Sheraton (21111 Haggerty Rd., Novi). Click here to for more information (including a link to the conference schedule), and click here to register. Martha Hilley is this year’s Conference Clinician and Leon Bates is the Conference Artist. There are many other sessions that look like very promising as well! I am so excited for the conference to get here! Not a member of MTNA (Music Teachers National Association) or your state association? Continue your professional development as a teacher by attending national and/or state conferences and local chapter meetings. Network and share ideas with other teachers at conferences and local chapter meetings. Become a certified music teacher (read more here). Enter your students in competitions, SAT testing, and other events. Read more about joining MTNA and your state association here. This worksheet is intended for beginner/early elementary students who have learned basic note values and musical terms. The student is instructed to match the musical symbol pictured on the left to each corresponding term on the right. Terms covered include: treble clef and bass clef, basic rhythms (quarter note through whole note), and dynamics (piano through forte). Stay tuned – another muscial terms worksheet is to come in the upcoming weeks! 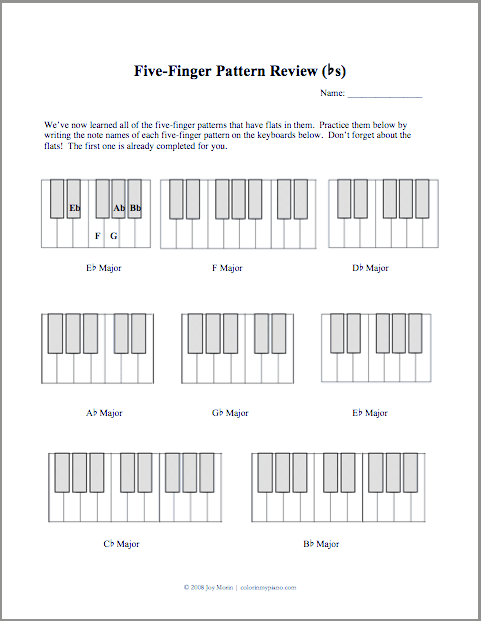 This worksheet is intended as a review of all the major five-finger patterns (5FPs) with flats; however, using the “WWHW” pattern template, students can easily figure out any 5FPs that they might not already be familiar with. This worksheet will help students become more familiar with the accidentals needed for each FFP and what each FFP looks like when played on the keyboard. A worksheet such as this works well in group lessons, or as an extra theory assignment for the private lesson. This worksheet corresponds to previously posted Five-Finger Pattern Review worksheet for FFPs with #’s. This week, I received an friendly email from a piano teacher in Texas who is looking for ways to professionalize her studio. I already sent her a reply via email but I was thinking that you readers may have some suggestions and advice for her too — so here are some of her questions! Should I maintain a webpage and how do I do that? Is what I have (20 students) enough to call it a studio? How do I know if I am charging enough? How do I find a place for a recital that doesn’t cost much? So please – share! What advice do you have for this teacher? Developing a good sense of rhythm is one of the most challenging parts of being a piano teacher. It’s not something that arrives overnight, and it’s something that must be maintained as the student advances to music with more advanced rhythms and time signatures. It truly is something that must be developed. A sense of beat. This means the ability to maintain a steady beat/pulse. This is probably the most common and most basic problem that students encounter when it comes to rhythm issues in their piece. The inability to maintain a steady beat/pulse is crucial for developing #’s 2 and 3 below. This worksheet is intended as a review of all the major five-finger patterns (5FPs) with sharps; however, using the “WWHW” pattern template, students can easily figure out any 5FPs that they might not already be familiar with. This worksheet will help students become more familiar with the accidentals needed for each FFP and what each FFP looks like when played on the keyboard. Look for corresponding the Five-Finger Pattern Review worksheet for FFPs with b’s coming soon!